The days sure fly by don’t they? I’m trying to soak up my little 13 month old…this is one of my favorite ages. We even match. I’m just finishing up a new table runner. I haven’t made pinwheels in so long…I forgot how much I love them. It took all my willpower not to stay up all night making a quilt top. I used this much loved method (see it in action here!). 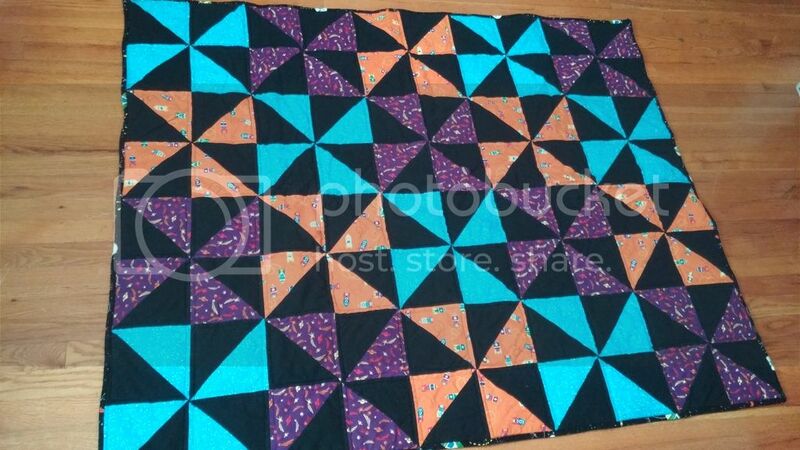 Basically you put 2 squares together, sew 1/4″ around the edges and make 2 diagonal cuts to make the half square triangles. The only thing I don’t like about this method is your left with bias edges that stretch really easy and distort. To prevent that, I starched my starting squares a lot…and my half square triangles turned out perfect. So perfect I didn’t even have to square them up…just trim off the little seam ears with scissors. …they are a permanent fixture on our floor. Random fact. 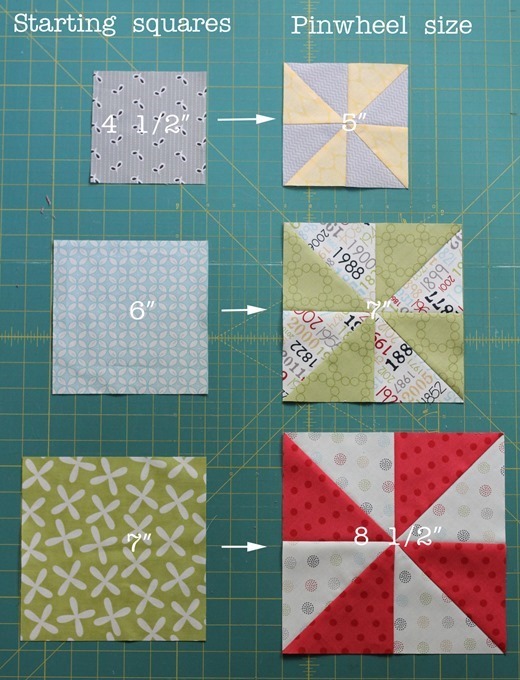 Here are the starting squares sizes and the finished pinwheel sizes I got from them. My pinwheels were squared up very slightly…the 7″ pinwheel was probably closer to 7 1/4″, but this is about the (un)finished size of pinwheels you can expect after squaring. It’s a great way to use up leftover charm and layer cake squares! Fabric diets are no fun…I'd rather go on a food diet! Love those cute little pinwheels, that's something I've not tried myself but I feel inspired now. Great tip about the spray starch, thanks! What brand of spray starch do you use? I want to use the same method to make a chevron quilt. I feel the same way about the bias edges. Starching does help. Cute fabrics! what kind of starch do you use? Thanks for the starching tip! Bias edges are usually not my friends (hence I have not tried that HST method), but I love the idea of making four squares at once. Love it. My math is terrible and I was needing a 6 1/2 inch block, could I get that from a 5 1/2 square? I can’t understand how cutting the square into triangles yields a larger square….. I think you WOULD get a 6.5 from a 5.5 since they got a 7″ from a 6″. Try it with muslin or scraps…It’s magic! Love the legos! They're always just out of the camera at my house, too. 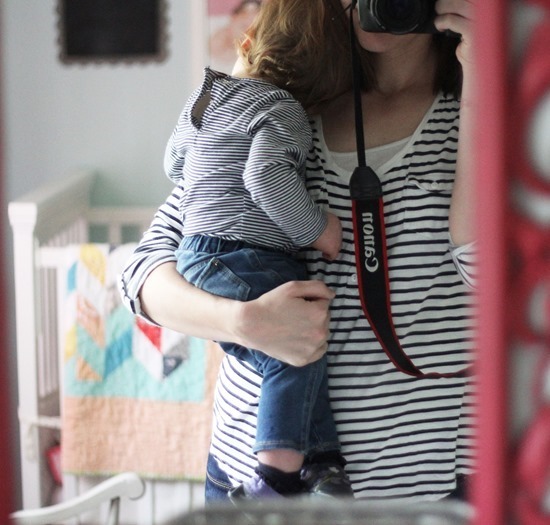 That picture of you and your sweet girl – MATCHING – just melts my heart. My baby boy turns 21 soon and it will be the first bday that we don't spend together. :( Cherish these days. What pattern did you use? I love the idea of a pinwheel table runner. Sounds like a fun summer project! Oh, I just went to look at the book on Amazon ~ looks like a great one~ put it on my wish list. Love pinwheels and they are so darned easy to make! I absolutely love pinwheels and love the fabrics you chose. I can't wait to see what you make with them and that table runner you keep promising! I hope you are planning on having it go on that beautiful farmhouse table your husband built! I remember or should I say my feet remember legos. My mom made this round mat that had a drawstring for my sons legos once he started using it my poor feet rejoiced. Just thought I'd pass the tip along as you're a sewing master it would be quick to whip up. 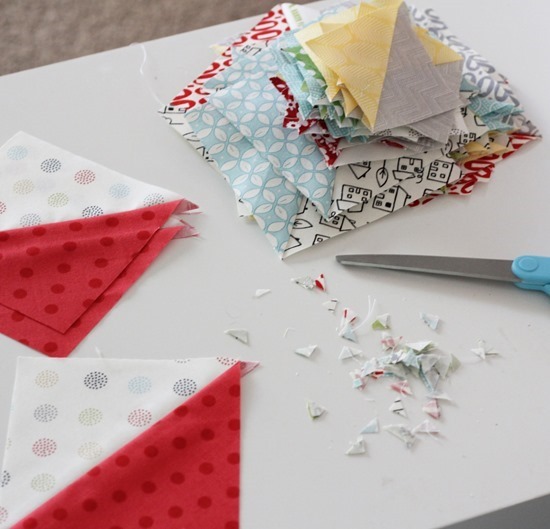 There are just so many things you can do with the simple half square triangle. I'll have to try this construction method. HST's are my favorite!! I haven't been sewing very much because I have 11 growing chicks. They are getting their feathers and will too soon be grown, just like children. I agree wirh you, 13 months to about 5 years are my favorite! This is my favorite method for making half square triangles. Legos rule. They are the best kid entertainment. 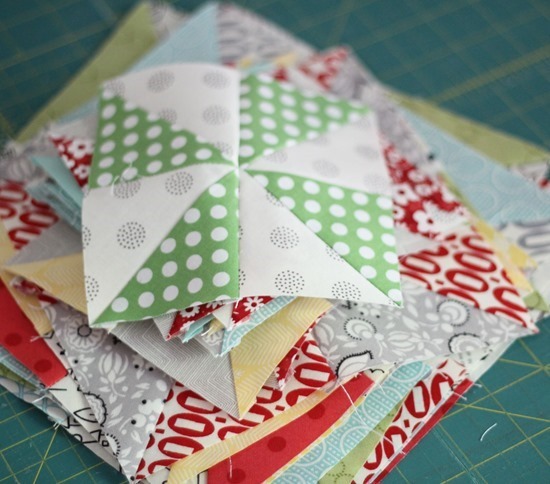 What a great way to make HSTs. Thank you!! Great blog. I have just started a blo myself. Your tutirials look great. I want to see the table runner! 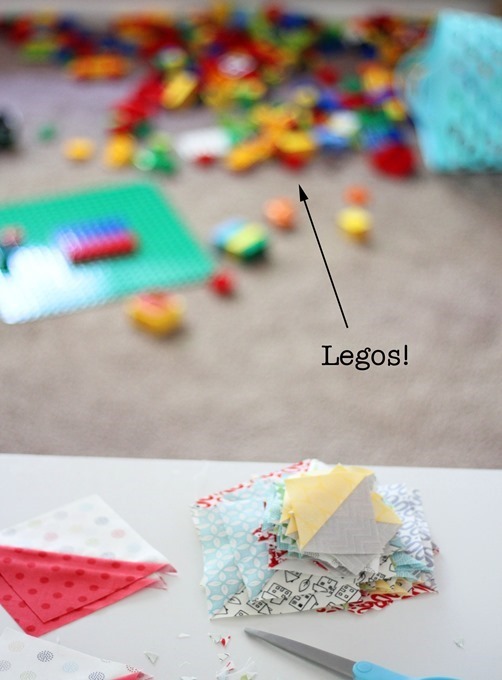 I have three boys under 5 …Legos live on my floor, too! How do they always know when they are missing ONE piece? Lego everywhere at my house too. I'm going to try your starching idea. Thanks. Love that method for making pinwheels, had not seen that before! Thank you for the great tutorial. I have been looking for a chart everywhere or some sort of formula. Have you see one anywhere? But I do my half square triangles * 8 & no bias edges. I just finished 208 HSTs made the four-out-of-one-square technique and it went great. It will eventually become my husband's sleep-with-it quilt. We use separate covers at night and he feels that since nearly everyone we know has gotten a new quilt in the last couple years, he believes it is his turn !~! Where, of where, do Ideas like that start ?~! I also love pinwheels. When I learned this method all I wanted to do was to make pinwheels. I love your Sea Glass quilt. The colors are beautiful and so soothing. Love it! 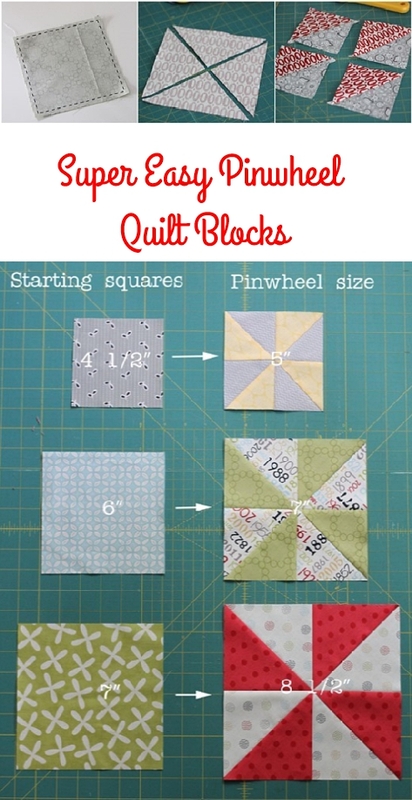 This is my next project–a baby quilt (or two) of pinwheels. Do you mind if I link back to this for directions as I make it (on my small, insignificant blog–Just for my family/friends and whoever else wanders in!)? Thank you! I wouldn’t have thought of the starch thing… I’m not wise in the ways of quilting yet. Great tutorial. Cute! Thanks for the inspiration. This was a great stash-buster! I used math and determined the mathematical equation for this as well it is as follows: ✔️(((Starting block size – 1″)^2)*2)= Pinwheel block size. If I run that equation with 6 as the starting block size I end up with 50 as the pinwheel size. If I run it with 6 as the pinwheel block size i get 19 as the starting block size. (That is using the caret ^ to signify exponentiation) according to the correct order of operations (PEMDAS).. (6-1)=5 5^2=25 25*2=50″ pinwheel block size. Aiming toward a 6″ pinwheel block gives me (((6^2)/2))+1 is 6^2=36 36/2=18 18+1=19 Explain to me please how using that equation will work for this.